C. F. Martin 000-21 Model Flat Top Acoustic Guitar (1947), made in Nazareth, PA, serial # 100354, natural lacquer finish, Brazilian rosewood back and sides, spruce top; mahogany neck with rosewood fingerboard, molded plastic hard shell case. This wonderful Auditorium-size Martin is a just-postwar 000-21 made in early 1947, still with a herringbone backstrip (the last remaining 'bone' trim was used up on these Style 21's). The 000-21 itself was never a very common guitar, 1947 was actually the peak production year for the model with 223 built. The Style 21 has the same materials as the more celebrated Style 28, just with plainer trim. Features include pearl dot inlay rosewood fingerboard, multiple top and back binding with tortoise Celluloid outer layer, an ivory Celluloid soundhole ring and a tortoise pattern Celluloid pickguard. 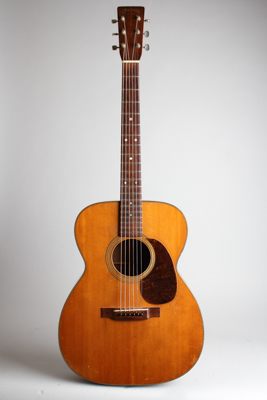 Like many guitars of this period it also shows a slightly deeper neck profile (for a Martin) compared to the previous thin wartime necks, with a comfortable round contour. This is a great sounding guitar equally at home with for finger- or flatpicking in virtually any style of music. Overall length is 40 in. (101.6 cm. ), 15 1/4 in. (38.7 cm.) wide at lower bout, and 4 1/8 in. (10.5 cm.) in depth at side, taken at the end block. Scale length is 24 3/4 in. (629 mm.). Width of nut is 1 11/16 in. (43 mm.). This lovely just post-war Martin shows some signs of play through the years-most notably some light top scratching, but overall not a lot of wear. The tuners are more recent Kluson Deluxes and the bridge has been shaved down slightly but overall this is a nicely original guitar. A recent neck reset and refret make this a very fine player, with a superb and very even sound. Excellent Condition.